Getting people in developing countries to warm up to cleaner cookstoves is, quite literally, more challenging than initially thought. 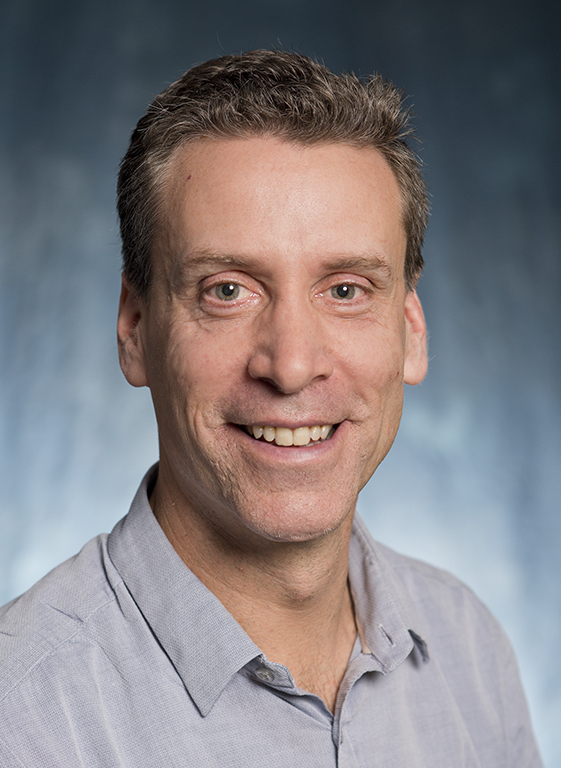 New research by a team that includes UW CEE Professor Julian Marshall indicates that indoor household air pollution levels were only slightly lower for families who were given new, cleaner cookstoves when compared to traditional stoves. The study was undertaken in rural India, where cleaner stoves were implemented with the goal of reducing household air pollution, which contributes to climate change and results in up to 10% of the mortality in low and middle income countries. Although initial studies in the laboratory indicated that the cleaner-burning stoves could reduce a family’s consumption of wood fuel by 67 percent, the study found no significant change in fuel consumption for families who used traditional stoves or cooked over open fires when compared to the new stoves. Real world adoption of the new cookstoves was less straightforward than originally anticipated for a variety of reasons. Of the families included in the study, about 40 percent chose to continue using the traditional stoves, especially when preparing traditional meals. The research paper was published in June 2016 in Environmental Science & Technology. This entry was posted in Uncategorized on July 27, 2016 by ceenews. Biodegradable plastic made out of chitin, an organic material derived from crustacean shells. 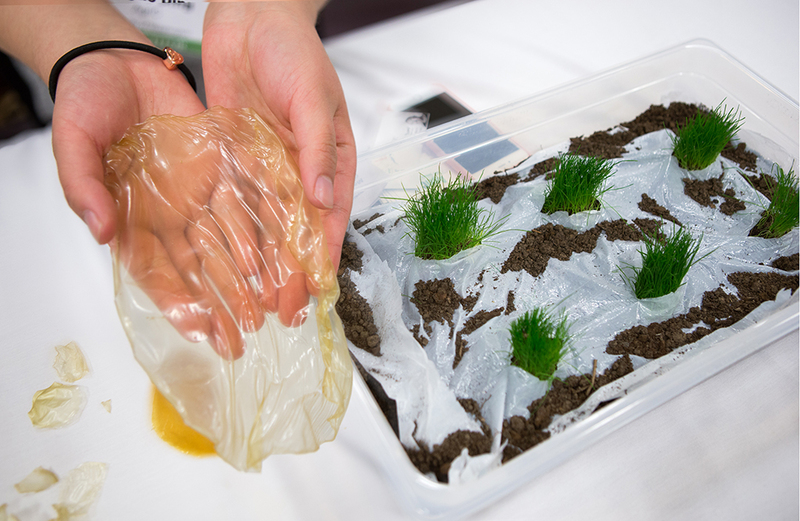 Creating a biodegradable plastic for agricultural uses that can suppress weeds and conserve water before decomposing into fertilizer sounds like a good idea. That’s what the judges thought, too. 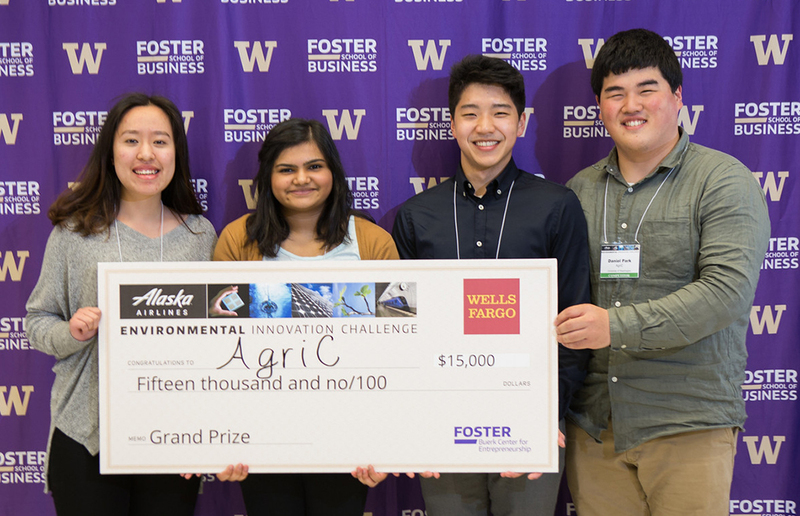 The grand-prize winning team at the eighth annual Alaska Airlines Environmental Innovation Challenge impressed judges by developing a new type of biodegradable plastic that may provide an alternative to conventional plastic mulch. Called AgriC, the winning team includes Civil & Environmental Engineering student Xinyao Ding. Competing against 23 teams from seven universities throughout Washington state, AgriC won the $15,000 grand prize. Ding’s team created the biodegradable plastic out of chitin, an organic material derived from crustacean shells. The biodegradable plastic is intended to be used to cover crops as a mulch film and decomposes into fertilizer after use. Although still in the research and development stage, the biodegradable mulch film may one day provide a more sustainable alternative to conventional plastic mulch, which is predominantly used in large-scale vegetable farming and the disposal of which is an emerging environmental concern. The product was inspired by research conducted by the Wyss Institute for Biologically Inspired Engineering at Harvard, which uses design principles from nature to develop more sustainable devices and materials. CEE junior Xinyao Ding, far left, is one of four students to win the grand prize at the Environmental Innovation Challenge in March 2016. Teammates are students Daniel Park (Foster School of Business), Moni Pal (Economics) and Andy Tan (Biology and ACMS). Ding oversaw development of the prototype. After contacting several local plastic manufacturers requesting to use their equipment to produce the mulch film, Ding was repeatedly told that the new chitin material may damage their machines. So, she made the prototype in her kitchen using chitosan powder and white vinegar. She is currently working to refine the recipe. Although her AgriC teammates will not be continuing the project, due to new jobs and internships, Ding plans to continue developing the product when she returns to China this summer. She hopes to eventually return to UW to earn her master’s degree. Held at Seattle Center in March 2016, the Environmental Innovation Challenge encourages student teams to present business ideas that positively impact the environment. More than 150 judges awarded a total of $36,000 to winning teams. The competition is hosted by the Buerk Center for Entrepreneurship at the UW Foster School of Business. This entry was posted in Uncategorized on July 26, 2016 by ceenews. 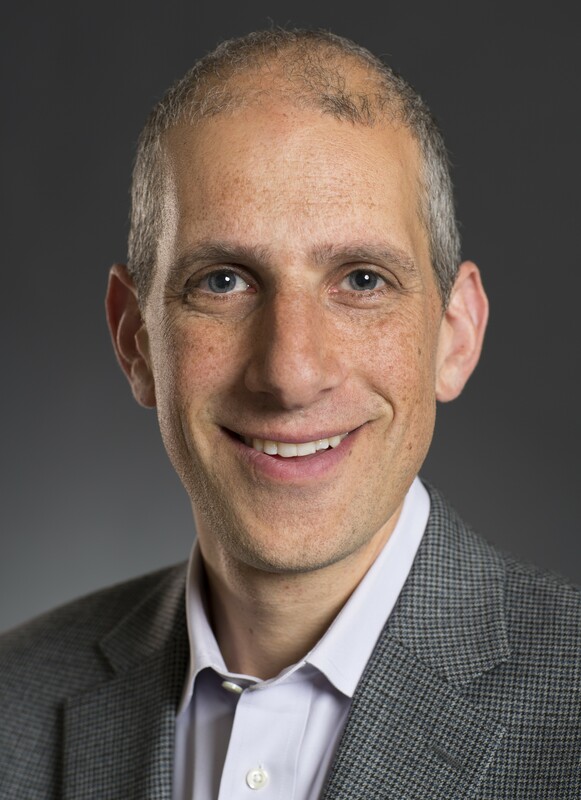 In recognition of his research on the deadliest landslide disaster in the history of the United States, Associate Professor Joe Wartman is one of two UW recipients of the Geological Society of America’s (GSA) 2016 Edward Burwell Jr. Award. Wartman is honored together with UW Earth and Space Sciences Professor David Montgomery, and five other researchers, who collaboratively collected data and published their findings in the aftermath of the Oso Landslide. The GSA’s most prestigious prize for engineering geology, the Burwell Award honors researchers who publish findings that advance current knowledge in the field. Two months after the March 2014 Oso Landslide, which killed 43 people and caused an estimated $120 million in damage and loses, the National Science Foundation-sponsored Geotechnical Extreme Events Reconnaissance Association sent the team of seven researchers, which Wartman co-led, to the landslide site to collect data and document conditions. The research team published their report, “The 22 March 2014 Oso Landslide, Snohomish County, Washington: Geotechnical Extreme Events Reconnaissance,” within months following their field work. In addition to data collected via aerial photographs, terrain models and satellite imagery, the team evaluated Doppler weather radar data, seismologic data and interviewed community officials and residents. In the report, the researchers detail how the landslide occurred in an area with a history of large landslides during the past several thousand years, many similar in scale to the 2014 landslide. The researchers documented how the landslide was preceded by an intense three-week rainfall and detailed several other factors that contributed to the catastrophe, such as changes in groundwater and weakening of geologic materials at the site. The researchers also presented a hypothesized mechanism for how the landslide was triggered and subsequently unfolded. The report includes several recommendations, including the need to carefully assess the zoning of communities near sloping ground; implementing monitoring and warning systems to reduce the impact of landslides; and utilizing advancements in imaging technology to better monitor and understand slope behavior and changes over time. The report was selected for the 2016 Burwell Award due to its high technical level and comprehensive nature, according to the award citation. The researchers were commended for their “exceptional job summarizing the event” and for making the report available in a timely manner following their field work. This entry was posted in Uncategorized on July 14, 2016 by ceenews.